Under the 1993 Railways Act, British government bodies such as Directly Operated Railways can only run passenger services in ’emergency’ circumstances, but there is no obstacle to foreign-government companies acting as operators. (Indeed, state-controlled companies from France, Germany, the Netherlands and Hong Kong participate in GB rail franchises.) On 29 October, Corby Labour and Co-op MP Andy Sawford introduced his 10-minute rule Bill to permit a GB public sector operator to compete against private companies for contracts to run passenger rail services. The Department for Transport will next month name which private company has won a competition for a long-term contract to operate the East Coast line. The line has been operated since 2009 by the UK Government-owned Directly Operated Railways, which stepped in to keep services going after National Express handed back the keys to the franchise. […] Baroness Kramer, Minister of State for Transport, on Tuesday pointed out the risks involved with bidding for rail franchises, which would have to be borne by the taxpayer under Labour’s proposals. The scoring of rail franchising bids is not a transparent process. Suppose a GB public sector entity were allowed into the current franchising environment, spending “£7 – 10 million” on a bid, and were then not awarded the contract? Conversely, if the GB publiCo was the successful bidder, what would be the response from other participants? On page 17 of the 30 October 2014 edition of the Birmingham Post can be found an article bearing the name of prime minister David Cameron. HS2, i.e. Adonis high speed rail, has been adopted with very few real changes, by the Conservative / Liberal Democrat government. 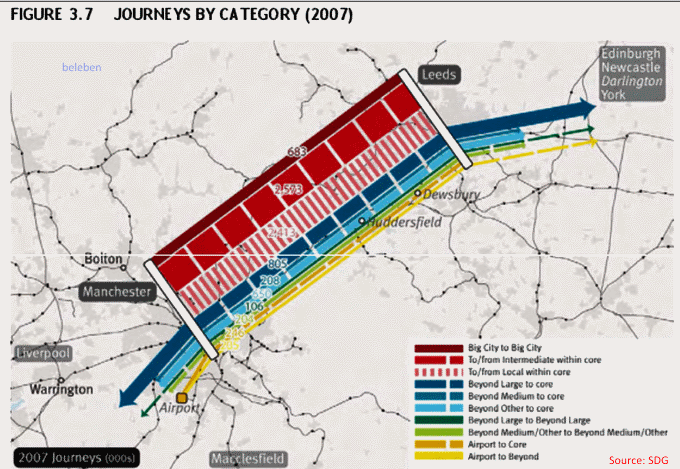 Even a Manchester to Leeds line was included in the 2009 documents. So, Labour’s plans were about getting people to London, faster. And the coalition’s plans are about getting people to London, faster. In an attempt to improve the standing of Britain’s very high speed rail project, government bodies and HS2 Ltd have “supported” nominally independent organisations to create favourable messages. The latest example of credibility buy-in is the Centre for Cities report “Fast Track to Growth: Transport priorities for stronger cities” (October 20, 2014) by Paul Swinney and Elliot Bidgood. Like Arup / Volterra’s “Understanding the transport infrastructure requirements to deliver growth in England’s Core Cities” (2011), ‘Fast Track‘ is a thinly-disguised high speed rail puff-piece, but for HS3 rather than HS2. The ‘knowledge-intensive business services’ (KIBS) angle introduced by Mr Swinney and Mr Bidgood, turned up again on October 27 in David Higgins’ “Rebalancing Britain” report. Since 2008, the commercial situation of France’s TGV high-speed railways has deteriorated. On 23 October 2014, the Cour des comptes (court of auditors) published a report which noted that the preference for TGV development over classic rail had resulted in an ‘incoherent, disconnected and inefficient system’. On 27 October, Economie Matin reported that train operator SNCF was planning “drastic measures” to reverse the decline. Le développement du TGV s’est opéré en substitution des trains à grande distance classiques Intercités. La préférence française avérée pour la grande vitesse a abouti à un système peu cohérent, où les rames de TGV desservent 230 destinations et passent 40 % de leur temps en moyenne sur les lignes classiques, ce qui nécessite en outre un parc important de rames. Sur certaines liaisons, les principales conditions de pertinence d’une ligne à grande vitesse (LGV) ne sont pas remplies, à savoir : connexion de bassins de population importants, durée de trajet à grande vitesse comprise entre 1h30 et 3h, peu ou pas d’arrêts intermédiaires, grande fréquence de circulation, taux d’occupation des rames élevé et bonne articulation avec les autres modes de transports. 8. veiller à ce que la définition des futurs ratios d’endettement du gestionnaire d’infrastructure conduise effectivement à ne pas financer des projets non rentables. It is interesting to note that the Cour des comptes recommended an optimal in-vehicle time for TGV journeys (given as 90-to-180 minutes). 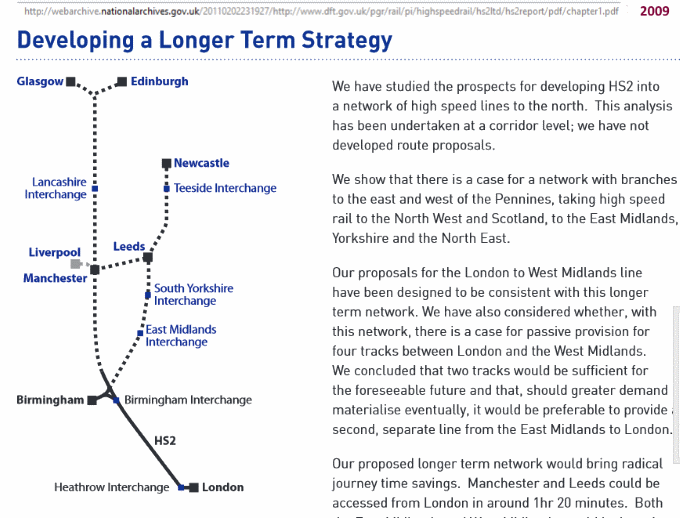 All the main flows in Britain’s proposed HS2 network would fall below the lower bound mentioned by the Cour des comptes, making Euston to Birmingham, and Euston to Manchester, Grandes Lignes (not TGV), territory. The arrival of High Speed 2 in the early 2030s would “result in particular pressure on the London Underground network, with potential for 30 minutes of queues at Euston to access the Victoria Line in the morning peak without Crossrail 2”, according to London mayor Boris Johnson. Mr Johnson is given to exaggeration, but with all the recent hullabaloo about ‘HS3’ and HS2 phase two, it’s important to bear in mind what a crock HS2 phase one is. The idea of funnelling nearly all fast trains from the north of England into Euston, and creating a 150-odd km long single point of failure south of Water Orton, beggars belief. At the latest relaunch in Leeds on 27 October, HS2 chief David Higgins backed the construction of a high speed railway across the Pennines, and proposed that a new body called The Northern Way Transport for the North be established to plan transport across Northern England. The government is now openly using the term “HS3” to denote a future Northern east west rail connection, although it was not too long ago that Patrick McLoughlin was expressing regret that the ‘new north – south rail link’ had been called HS2, because it was ‘not about speed’. The prime minister estimated on Monday that the new east – west line HS3 could cost as much as £7 billion. […] But much depends on what sort of improvements the government decides to pursue and these are still not decided. Options range from upgrading existing lines to building a brand new Manchester-Leeds link involving extensive tunnelling under the Pennines. Improvements to rail infrastructure in the North are long overdue, but if HS3 took the form suggested by ‘One North‘, it would be another scandalous waste of resources. As can be seen from the diagram above, the demand for end-to-end rail travel between Manchester and Leeds is way too small to justify billions of pounds being spent on digging a new trans-Pennine tunnel. Infrastructure improvements should be planned openly, on the basis of maximising economic utility, rather than on meeting the needs of lobbyists.